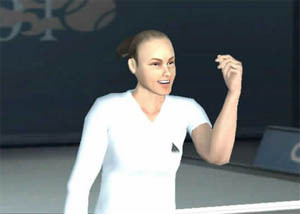 "Play against Pat Rafter or Anna Kournakova in one of the most realistic and exciting tennis games on the PlayStation 2"
Smash Court Tennis Pro Tournament contains some of the most amazing graphics to hit the PlayStation 2. The game starts with a beautifully rendered CGI cinematic that showcases the game through some stunning visuals. Once you get into the menus, you are treated to a professionally done menu system that includes a wide variety of different options. The graphics of Smash Court tennis are truly amazing as seen by the screenshots on the left. The characters are extremely well animated and have a high polygon count that really shows the detail and allows for great facial features. The characters almost look like the real players. The game runs at a steady 30 frames per seconds and is extremely smooth. The stadiums are well detailed and resemble their real world counterparts. The only problem is that the crowd looks a little too generic, hopefully one day games will be able to deliver a realistic looking crowd. Before the tournament starts, you are treated to some more very nice looking CGI cutscenes that seems to have been directed by a music video director. Although these movies seem are little short, they do help add to the atmosphere of the game. The gameplay of Smash Court Tennis is extremely easy to pick up and there are three different kind of hits that your players can perform that include, powerful topspins (Circle), slices (X) and drops/lops (Triangle). Each player has their own unique playing style, for instance, All-Around Player, Net Player and Fast Stroke. There is also a wide variety of moves that are automatically done such as dives, rolls and even stretching up to hit the ball. The beauty of Smash Court Tennis is that it supports the PlayStation 2 multitap, so you can play against four real players. 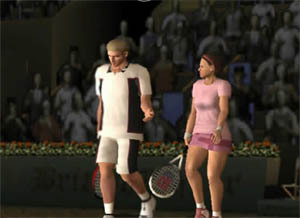 The music Smash Court Tennis is relegated to the cutscenes and menus which is ideal because you would not want to hear the music while you are playing your tennis match. Apart from the music, the sound effects are excellent, from the court noises to the commentators, everything is perfect. You even hear the familiar grunts of a certain female tennis player that we will not mention. 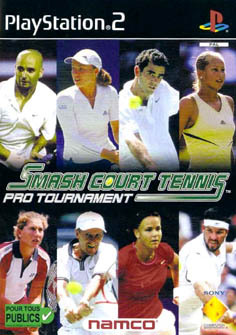 I highly recommend Smash Court Tennis Pro Tournament to any tennis or sports fans and for those wanting a realistic tennis game with an arcade feeling to it. The game is an extremely well polished game from start to finish, both graphically and gameplay wise and once again Namco have delivered. Highly Recommended! 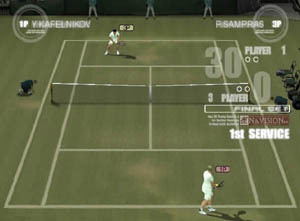 An awesome tennis game for the PlayStation 2. One word of caution, be careful...this game is extremely addictive.